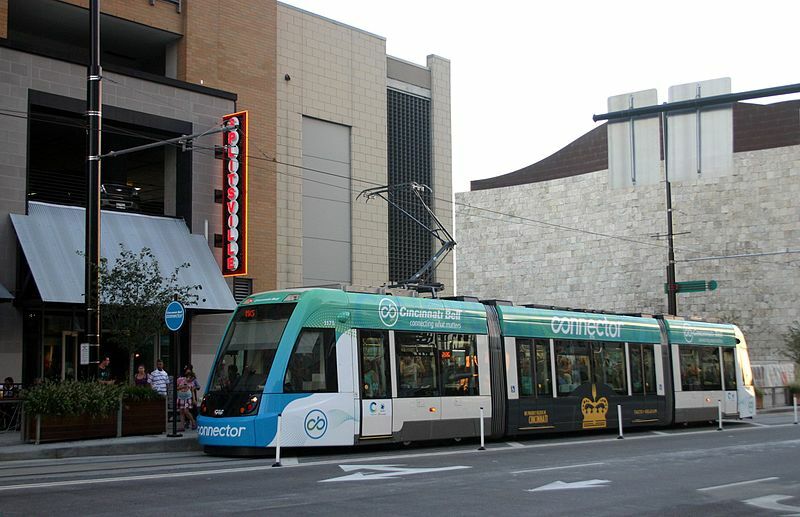 The newly introduced second-generation Cincinnati streetcar line. Horse-drawn streetcars: 14 Sept. 1859 - 1904. Electric streetcars (1st generation; dual wiring): 1888 - 29 Apr. 1951. Electric streetcars (2nd generation): 9 Sept. 2016 - today. Cable cars: 17 July 1885 - 9 June 1902. "Inclined railways" (funiculars carrying streetcars between different levels; powered at first by steam, later by electricity): 1872 - 1948. Streetcars (1st generation): 1588 mm. Streetcars (2nd generation): 1435 mm. Interurbans: 1435 mm., 1588 mm. 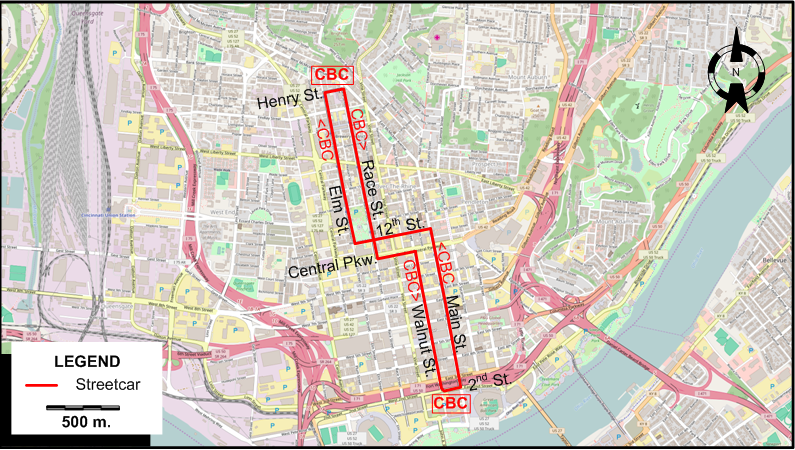 Pence, H. "At last, Cincinnati gets its metals", Tramways & Urban Transit, June 2013 (76: 906), p.256-258. 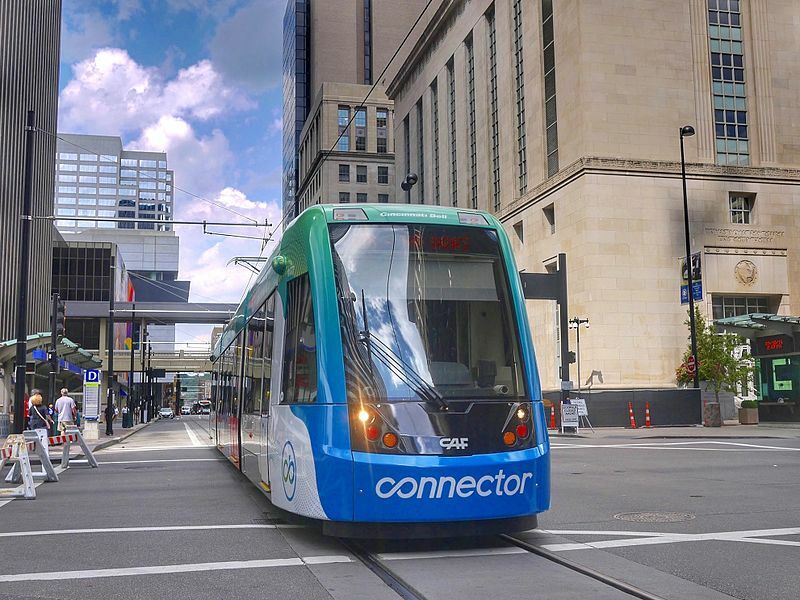 Pence, H. & Retallick H. "Re-connecting Cincinnati", Tramways & Urban Transit, Nov. 2016 (79: 947), p.421-425. Wagner, R.M. & Wright, R.J. Cincinnati streetcars - No.9: Streamliners and war horses. Wyoming (OH): Trolley Talk, 1984. Historical Atlas of Cincinnati: The Relationship Between Transportation and Urban Growth in Cincinnati.